Somewhere around the time I became a pinup I also developed a serious thing for tartan. And plaid. Check. And all the other ways in which you can describe a cosy feeling criss cross of lines in various colours that I do not know the technical difference between yet all make me think of Christmas and log cabins and chopping wood. Those 3 things are things I’m totally down with. My dream is to own a circle skirt in my 3 favourite tartan colourways: blackwatch green, navy with red, and red. But there’s plenty of temptation out there in the form of dresses too; in many forms, really, and across a wide price range. So for all you plaid and vintage loving dolls out there I thought I’d lay out all the plaid options I’ve come across recently that have had me drooling. Vivien is perhaps queen of the tartan. Their circle skirts come in 5 tartan colourways, but they also offer pinafore pencil skirts in 7 tartans too, 3 plaid swagger jackets, aaaand pencil skirts in 8 tartan colourways. Below is just a taste of all VoH has to offer. You can get two plaid print items from Voodoo Vixen, the same tartan colourway available as either a classic cap sleeved wiggle dress or a pinafore style flared dress–with pockets! The latter doesn’t have a full circle skirt, so bear that in mind if you’re adverse to the slimmer skirt style. 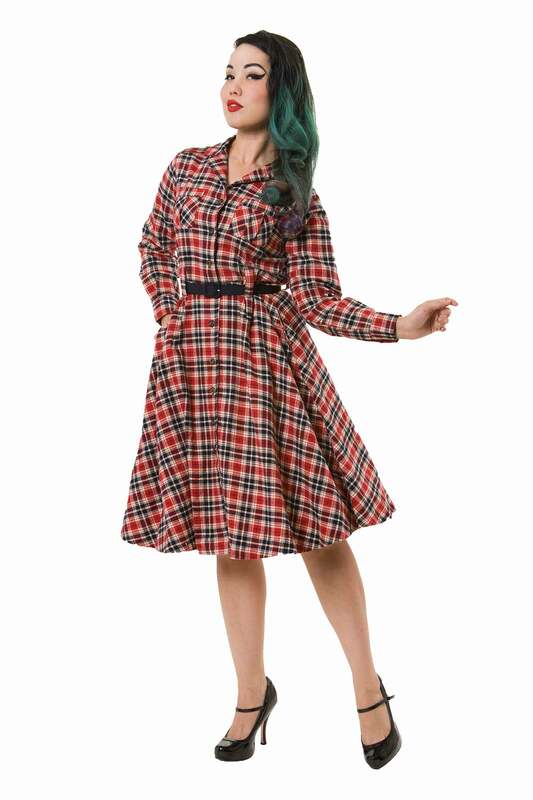 Collectif offers some beautiful plaid pieces, as dresses, pencil skirts, a couple jackets, and some full skirts. Tatyana has the Miranda dress, which I want badly because, hello, plaid, a swing skirt AND sleeves! It’d like being the chicest lumberjack in town. Offer their classic Audrey swing dress in two ‘Tastefully Tartan’ plaid colourways, a plaid pinafore wiggle dress and a tartan pencil skirt shirt dress. Miss Candyfloss has a host of gorgeous tartan and plaid numbers, all of which I would happily own if I had the money. If Bernie Dexter is a brand that works for you in terms of sizing and fit then the Saturday Night Dress in black plaid is gorgeous. There’s also the Sunday Morning dress in Blue Tartan and the Lori dress in red tartan. Do you own any of these gorgeous pieces, or any other tartan/plaid cuties in your closet? Does tartan give you the same snuggly christmassy feels it gives me? This entry was posted in Lust List and tagged 50s, lust list, pinup, plaid, retro, style, tartan, winter, wishlist by missamymay. Bookmark the permalink. I have a teal & black tartan VoH skirt and I love it! It’s definitely very wintery, but I did look forward to being able to wear it again as the days started getting shorter this year. Tartan is just so perfect for winter! I just got my hands on a VoH tartan circle skirt and can’t wait to share it with you guys next week. I also have a serious thing for plaid. Thanks for sharing! I’ve been looking for just the right plaid pencil skirt for some time. You and me both, lady. I now have 2 of these…got a long way to go!